Holly D'Lane has moved to Houston! 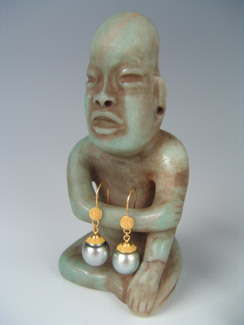 South Seas Pearl Drop Earrings 2000 A.D.
Pre-Columbian Seated Figure 1000 B.C. Hope to see you in Los Angeles, Boston, New York, D.C., Seattle, or Houston in 2008! After 17 years in California, I'm on to new adventures in Texas. If you are ever in Houston, please call or email to get together and experience some Southern hospitality, Texas style!